The wooden skeleton revealed, prior to application of the thin plywood skin. 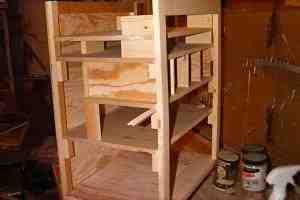 There are two basic techniques of cabinet construction: Casework, which reached its apex in the glory days of the big console radios, tends to be labour-intensive and easy on materials; Box-and-Frame, which lends itself well to assembly-line techniques, tends to be the opposite. Having little time but still less money, one might easily guess which I prefer. This unit will be ready "One of these days real soon now..."